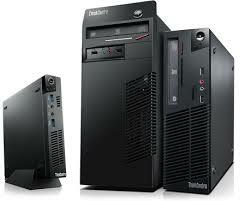 Lenovo M Series towers and small form factors (SFF) are a boon to any IT team. These industry-leading business machines are also stable and manageable, making them the perfect solution for any corporate rollout. With their minimal footprint, clutter-free design, and professional appearance, these Lenovo M Series all-in-ones are a welcome addition to the corporate desk. Lenovo M Series Tiny desktops provide big-business performance with impressive processing power and 15 months of platform stability — all while remaining energy-efficient and saving you space.